Fasteners - Amity Insulation Group Inc.
Amity supplies the quality fasteners required to work with your insulation and jacketing, and complete your mechanical insulation system installations. 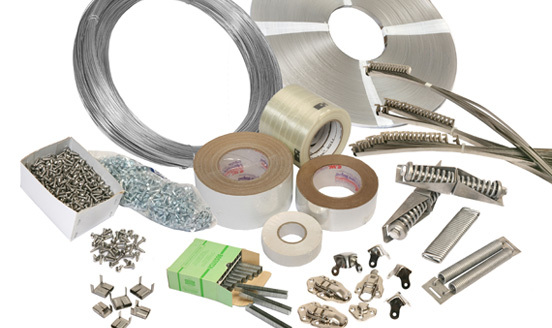 Our stainless steel strapping/banding at Amity is manufactured from Type 304 stainless steel, available in ½” x .015, and .020 and ¾” x .020 thicknesses, in ribbon and oscillated wound coils, or pre-made fabricated straps and wings seals. Wing seals manufactured on site by Amity are available in stainless steel and made to match the width of strapping material used. Amity’s stainless steel seals, springs, suitcase latches, and other accessories are available for specialized job applications. Amity’s stainless steel screws are made from T304 stainless steel, providing effective fastening for all types of sheet metal jacketing and duct work. Our stainless steel wire is Type 304 soft annealed, available in both 18 and 16 gauge thicknesses.